Keep your knees up as you head down to the last Pelvis of 2013. 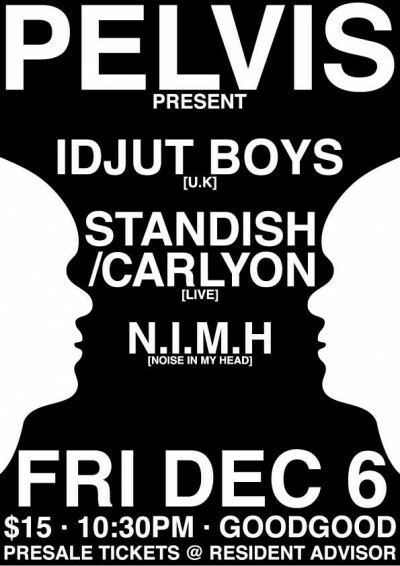 Punctuating the parquetry on December 6th alongside Pelvis are Standish/Carlyon, Idjut Boys (UK), and Noise In My Head. Producers, DJ’s and record label owners of 20 years, the UK’s Idjut Boys play and purvey the very best of the simmering social lubricant that is dance music. Standish/Carlyon’s debut record ‘Deleted Scenes’ has been out for a short while now, but this is the deb ball Sydney is yet to give them. A late night slot for late night sounds.Noise In My Head is also gracing Pelvis with his presence once again to show off his extraordinary plastic plate collection.